To begin the year, the third graders learn about place value. We first review hundreds numbers. We eventually move on to numbers in the thousands. Here we can see a group of students using place value blocks to create a number on a huge place value mat. ​Here we see Laynie, Devin, and Regan working on their place value mat to create another thousands number with place value blocks. Another group is working on place value using blocks and a place value mat. Next, we move on to explore addition and subtraction of larger numbers. We use place value blocks to help us understand the concept of borrowing and regrouping. Here we see Carson and Regan working to build an addition problem using place value blocks. ​One of the most important math concepts learned in the third grade is multiplication. 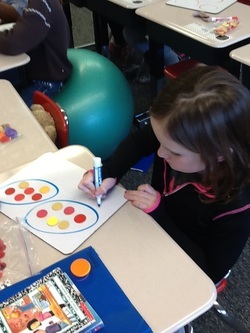 To begin this unit, students use counters to make equal groups. This way, they understand the meaning of multiplication. ​Kai is making equal groups using counters. ​Here is a game students play to practice their 6's. To begin each math lesson, we complete a geometry short to quickly introduce and explore geometry concepts. To help explore the idea of volume, we completed a S.T.E.M. challenge called Volume City. Students were put into groups and given the challenge to build a section of Volume City. They were required to build at least two buildings on their sections. The buildings had to be labeled with their volume. ​Here we can see a section of Volume City. Here we see Taylor, Claire, and Ali working on their section of Volume City. Students were given strict material and time constraints for this challenge. 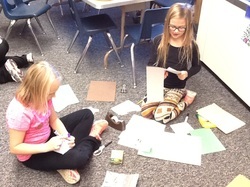 ​Ali is also working with her group to complete this S.T.E.M. challenge.